MrNussbaum.com was developed with the idea that crucial concepts, themes, ideas, and fact sets taught in the classroom can be enhanced over the internet through interactivity. Furthermore, for teachers to have a reliable k -8 internet site to use in the computer lab or in the classroom, that likely covers one or many themes currently being taught. MrNussbaum.com offers dozens of interactive games specifically designed to pinpoint one or several essential concepts taught in elementary years, and dozens of research themes designed to make the process of gathering information interactive and enjoyable. MrNussbaum.com, however, does not just present information, but in addition, provides numerous interactive activities to complement the presentation of interactive information. * MrNussbaum.com aims to create an indispensable learning atmosphere for kids in grades K-8, that successfully blends fun with learning. When students associate fun with learning, anything is possible in terms of skill-building and achievement. * MrNussbaum.com aims to create learning games that reinforce skills as well as challenge students to improve upon skills they already possess. * MrNussbaum.com aims to create educational games in which students can role-play. We have found that kids become much more immersed in educational games if they can take on an unusual role (such as an arm-wrestling pretzel, a super hero trying to save the world from alien decimals, or a hero trying to dispatch of a band of horrid place-value pirates). * MrNussbaum.com aims to create learning applications and interactive materials that help make the learning of elementary concepts interactive in all subjects. 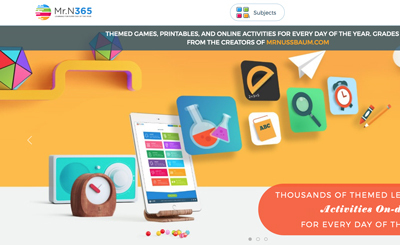 *MrNussbaum.com aims to create a learning resource in which teachers can find and utilize a huge variety of different interactive and printable materials to use with their students. *MrNussbaum.com aims to create an environment in which parents and teachers can smply let their children explore, and know they are benefitting. *MrNussbaum.com aims to become the first place parents and teachers explore when looking for interactive ways to present and reinforce elementary concepts.